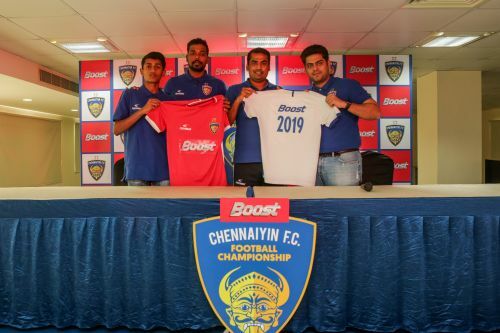 Two-time Indian Super League champions Chennaiyin FC and GSK’s leading health food drinks brand Boost have come together to form the Boost Chennaiyin FC Football Championship that is set to begin tentatively on January 28 at the MCC School Ground in Chetpet. With the aim to develop grassroots football in Chennai and Tamil Nadu, the four-week long tournament will feature 1100+ children from 64 school teams across two age groups (U-13 & U-15), it was announced at a joint press conference at the Centre for Sports Science. The partnership also marks Boost coming on board as CFC’s Official Energy Partner. In line with CFC’s philosophy of developing youth football, the top three teams from both age groups will receive access to coaching from the Chennaiyin FC coaching staff and select first team players. It falls under Boost's initiative of ‘Play The Pros’ wherein selected kids get to play with and learn from their favourite CFC heroes. CFC Assistant Coach and Technical Director for Youth Development, Syed Sabir Pasha, inaugurated the tournament in the company of first team midfielder Dhanpal Ganesh, U-15 player Rahul K Manjula and club Vice President Hiren Mody. “The ultimate objective is to have budding talent from this tournament absorbed into the youth teams’ pyramid underneath the CFC first team that comprises the U-13s, U-15s, U-18s and B team. The association with Boost and this Championship aligns with our goals of promoting young talent like Rahul from Chennai and the state,” Pasha said. Rahul is a shining example of a youngster coming through the CFC ranks. Rahul captained and shone for the U-13s in their debut season last year as they won the U-13 Youth League Chennai zone with a 100% record en route an appearance in the final round. With the Boost Chennaiyin FC Football Championship contested in the U-13 and U-15 categories, the club can unearth diverse talent and hone them. Elucidating on the partnership, Vikram Bahl, Area Marketing Lead, GSK Consumer Healthcare said, “Young children deeply associate with sports stars and look up to them for inspiration. Boost's partnership with CFC for the Football Championship gives kids a unique platform to learn and play with the Pros. "Through this partnership we intend to inspire young kids and nurture young talent in football." Boost intends to take its purpose of “Unleashing The Winner In Kids” beyond an inspiring message and provide kids with unique platforms to learn and prepare to play a bigger game.